A dialogue conference of the “Business for Peace in the Greater Mediterranean Region,” project which has been developed by Melsa Ararat, Sabancı University Corporate Governance Forum Director with support of the Hollings Center for International Dialogue, was held in Istanbul, Turkey on November 29, 2018. Number of academics, business and NGO representatives from Turkey, Netherland and Lebanon have attended to the meeting; hosted by TUSIAD, the Turkish Industry and Business Association. During the meeting, the idea of “Business Coalition for Peace” was discussed. This coalition is based on the understanding that companies in fragile and conflict-affected countries can play an important role in the establishment of peace. TÜSİAD Secretary General Bahadır Kaleağası made the opening speech of the roundtable. Kaleağası emphasized the importance of the meeting for the working groups and subcommittees of TÜSİAD. Melsa Ararat, Director of the Corporate Governance Forum at Sabancı University, reminded that the United Nations Sustainable Development Goals bring together the business world, governments and civil society around measurable targets. Michelle Westerman-Behaylo from Amsterdam University made a presentation at the meeting. In his presentation, he discussed why the business world should support peace. Also Arıkan Açar and Elif Çetin from Yaşar University gave a presentation entitled “Challenges around Peace and Security Stability in the Great Mediterranean Region”. Please click to see final report of roundtable. 6th Annual Conference of Women on Boards Turkey with its name ‘Transformation on Corporate Boards and Business held on 27 November 2018, Tuesday at Zorlu PSM by Sabancı University Corporate Governance Forum. Opening speech of the meeting held by Şirin Tekinay, Vice Rector of Sabancı University. Sabancı University Corporate Governance Forum Director Melsa Ararat has presented ‘ The Women on Board in Turkey, 2018’ report. ‘Women Empowered Boards’ Awards has given also in the conference. Click here for registration form. Sabancı University Corporate Governance Forum Director and School of Management Professor Melsa Ararat moderated the "The Impact of Diversity of Boards on Company's Financial Performance" Panel at 22. International Internal Audit Congress held on 22-23 October 2018. The second one of the new series of CGFT Policy Papers on governance is published. The paper is written by CGFT director and researcher Melsa Ararat and CGFT related researcher Muzaffer Eroğlu. Please see Turkish version of the paper here. Companies and Independent Board Members: Decisions are taken for whose benefit? The first one of the new series of CGFT Policy Papers on Governance is published. The authors of the paper are CGFT director and researcher Melsa Ararat and CGFT related researcher Muzaffer Eroğlu. Please see Turkish version of the paper here. 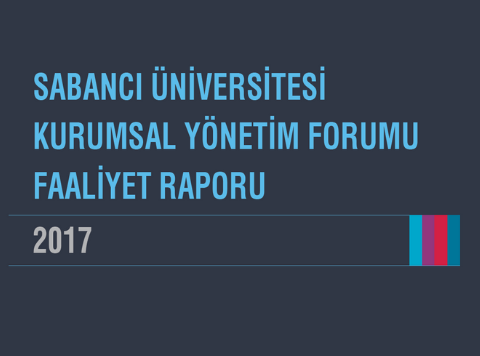 Sabanci University Corporate Governance Forum have published CGFT 2017 Activity Report. Please see the Turkish version of the report here. CDP Turkey 2017 Climate Change and Water Reports are launched on 28 November 2017 at Zorlu PSM by the event called "Reimagining Disclosure: CDP Climate Conference". Find CDP Turkey 2017 Water Report here. Find CDP Turkey 2017 Climate Change Report here. Find CDP Turkey and Global reports findings and press release here. Sabancı University Faculty Member and Corporate Governance Forum Director Melsa Ararat was elected for the third time to membership of the board of governors of ICGN (International Corporate Governance Network), a community that brings together asset managers and investors representing USD 26 trillion of capital. Melsa Ararat continues to be the first and only academic sitting on the ICGN board of governors, which has the power to influence investments and financial markets, particularly in the UK and US, through publishing guidances, discussion papers and surveys. Please clik here to read more. Implemented by the Sabancı University Corporate Governance Forum in association with Garanti Bank, the CDP Turkey 2015 Water Program Report was revealed. The CDP Turkey Water Results Report prepared to analyze the responses of companies from Turkey was presented to the public in a conference at the Zorlu Performing Arts Center on Thursday, December 8, 2016. Introductory remarks to the main outputs of the CDP Global Water Report and the results of the CDP Water Program in Turkey were given by Garanti Bank Assistant General Manager Ebru Dildar Edin. The keynote speaker of the conference was Coca-Cola Turkey, Caucasia and Middle East President Galya Frayman Molinas. Following the keynote, CDP Water Program Director Morgan Gillepsy presented the CDP Global Water Report results in a live video conference. The CDP Turkey 2016 Water Program results were presented by Sabancı University CDP Turkey Projects Director Mirhan Köroğlu Göğüş. The event continued with the CDP Water Leaders Panel moderated by Sabancı University Vice President Professor Sondan Durukanoğlu Feyiz. Speakers of the panel were Garanti Bank Vice President Ebru Dildar Edin, Şekerbank Vice President Aybala Şimşek and Pınar Quality Manager Birol Delibaş. The panel was followed by the ‘CDP Turkey 2016 Water Leaders Award Ceremony’. The ceremony began with a speech by CDP Turkey Reporting Partner Deloitte Turkey CEO Humphry Hatton. Garanti Bank Vice President Ebru Dildar Edin, Şekerbank President Servet Taze and Pınar Süt Quality Manager Birol Delibaş received their prizes on behalf of their respective institutions. The conference concluded with closing remarks by Sabancı University Corporate Governance Forum and CDP Turkey Director Melsa Ararat. 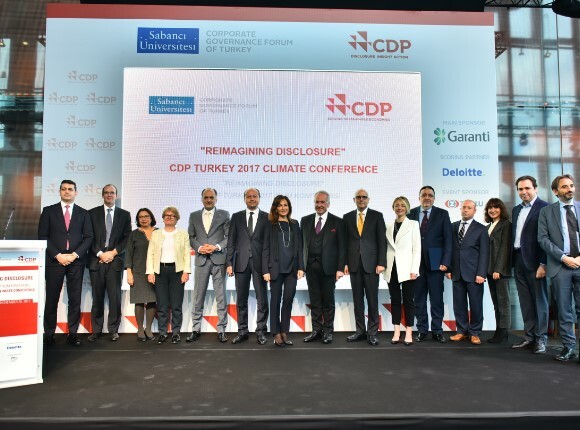 The Sabancı University Corporate Governance Forum revealed the results of the CDP Turkey 2016 Climate Change Program in a conference at the Zorlu Performing Arts Center on Wednesday, November 30, 2016. The CDP Global A List Awards and CDP Turkey Climate Leaders Awards were presented during the conference. The event began with a video message by CDP President Paul Dickinson. Introductory remarks were delivered by Çimsa General Manager Nevra Özhatay. The keynote speaker of the event was International Corporate Governance Network (ICGN) Policy Director George Dallas. CDP Vice President Sue Howells presented the CDP Global Climate Change 2016 Report Results in a live video conference. Afterwards, Sabancı University Corporate Governance Forum Director and CDP Turkey Director Melsa Ararat presented the results of the CDP Turkey 2016 Climate Change Report. Presentations were followed by the CDP A List CEO Panel moderated by Posta Ankara Correspondent and CNN Türk Hafta Sonu Presenter Hakan Çelik. Speakers were Arçelik CEO Hakan Bulgurlu and Garanti Bank CEO Fuat Erbil. The event concluded with the CDP Global A List and Turkey Climate Leaders Award Ceremony. The 193 companies that performed exceptionally and went on the Global A List had been announced on November 25 at the CDP Headquarters in London. Only two companies in Turkey, Arçelik and Garanti Bankası, were included in the 2016 list. Arçelik CEO Hakan Bulgurlu and Garanti Bankası CEO Fuat Erbil received prizes on behalf of their respective institutions. Seven other companies were given the “CDP Turkey Climate Leaders Awards” this year. The awards were received by Brisa Human Resources and Institutional Development Director Nilgün Özkan, Coca-Cola İçecek Corporate Relations Director Atilla Yerlikaya, Çimsa General Manager Nevra Özhatay, Ekoten Tekstil General Manager İzhak Aydın Öztürk, Migros Human Resources and Industrial Relations Assistant General Manager Demir Aytaç, Pınar Süt General Manager Gürkan Hekimoğlu and Tofaş External Relations Director Güray Karacar on behalf of their institutions. The awards were presented to winners by Sabancı University Vice President Sondan Durukanoğlu Feyiz. Turkey Report of CDP Climate Change Program is released to the public by Sabanci University Corporate Governance Forum under the sponsorship of Akbank and with the support of Deloitte Turkey’s rating system and report. The report was released at the meeting organized in Sakip Sabanci Museum, the Seed Center, November 19, 2015. Creating a platform in which companies can share their strategies towards climate change with their institutional investors, CDP is considered as the world’s most prestigious and widespread environmental initiative. 2015 Turkey CDP Climate Change Report includes the analysis of the responses from 46 companies including some from Turkey. From the beginning of CDP Turkey Climate Change Project, the number of companies responding has increased 250%. 95% of the responding companies reported that they are approaching climate change as a senior and board of directors level issue. In addition 89% stated that they are integrating climate change into their business strategies. During the meeting that the 2015 CDP Turkey Climate Change Report was announced, the opening speech was made by Akbank Investor Relations and Sustainability Department Manager Cenk Göksan. After that, General Secretary of United Nations Framework Convention on Climate Change, Christiana Figueres’s speech was featured. The main speaker of the meeting, Head of BlackRock Europe, Middle East and Africa Corporate Governance, Amra Balic’s speech was followed by Paul Dickinson, Executive Chairman of CDP. Melsa Ararat, the director of Sabanci University Corporate Governance Forum and CDP Turkey, gave further information on 2015 CDP Global Climate Change Report and 2015 CDP Turkey Climate Change Report. The speeches were followed by the award ceremony . During the ceremony, CDP Turkey Climate Leaders were rewarded and companies from local “CDP Climate Disclosure Leadership Index” ,TSKB, Brisa, Garanti, Turkcell and Arçelik, were given the “CDP Turkey Climate Disclosure Leader” award. Garanti Bank was the only Turkish company that was in the global “CDP Climate Performance Leadership Index” list and therefore was given “CDP Turkey Climate Performance Leader” award. You can find the complete 2015 CDP Turkey Climate Change Report here. You can reach the newsletter including the summary of the report from here. World’s most powerful and active environmental non-governmental organization CDP’s Global Water Report, which aims to set private sector in motion regarding water resources, and Turkey’s results were announced during the meeting on October 27, 2015 in Salt Galata. According to CDP’s new Global Water Report ‘Accelerating Action’, a total number of eight companies around the world deserved to be ranked in CDP’s Water A List due to their approach to water management. None of the companies in the list are Turkey based. On the other hand, according to Turkey’s results 36% of the companies report that they have endured water based negative effects during the last reporting year. While 64% of companies report that water has become a significant risk, 86% is reporting that water is creating an opportunity for their companies. CDP’s Water Program was put into practice in 2015 by Sabanci University Corporate Governance Forum with the support of Garanti Bank. Besides the output from CDP 2015 Global Water Report, CDP Turkey Water Results Report including analyzes of Turkish companies that responded, prepared with the support of Deloitte Turkey, was announced to the public on 27 October 2015 Tuesday, 10:00 in the meeting at Salt Galata. The opening speech was made by the vice rector of Sabanci University, Prof. Sondan Durukanoglu Feyiz and Deputy General Manager of Garanti Bank, Ebru Dildar Edin during the meeting that the major outputs of CDP Global Water Report and CDP Water Program’s Turkey results were shared. After the video message of the president of CDP Water Program, Cate Lamb, Dr. Melsa Ararat, the director of Sabanci University Corporate Governance Forum, presented the CDP Global Water Report and Turkey’s results. Sustainable Investment in Turkey: The Case in Context - An Update, 2014 report is publiahed by Sabancı University Corporate Governance Forum (SU CGFT). The report is the final report of Sustainability Index Workshop Project organized jointly by SU CGFT and the UN Sustainable Stock Exchanges Initiative and sponsored by the British Government. The report is a sequel to the “Sustainable Investment in Turkey, 2010” report (IFC, 2011). Although this paper provides an update to the relevant sections of the original report, its ultimate objective is to reflect on Turkey’s experience as a case study to assess the feasibility of sustainability indices in promoting Sustainable Investment in emerging markets. The report provides an account of the Emerging Markets Corporate Governance Research Network (EMCGN) and its first 10 years of activities. The paper describes the history of the EMCGN and its objectives—to stimulate research focused on corporate governance in emerging markets as well as transition and developing countries - its structure, which is a joint undertaking of corporate governance research centers and internationally recognized scholars with IFC Corporate Governance acting as its catalyst; and its modalities: organizing workshops, holding biannual conferences, and disseminating and communicating research. As a summary, main purpose of the Emerging Markets Corporate Governance Network (EMCGN)’s is to stimulate research focused on corporate governance in emerging markets as well as transition and developing countries. The Network aims to raise the academic quality of corporate governance related research through fostering international exchanges among scholars in all regions, providing young and promising scholars with exposures to international experts, and exploring the common aspects of corporate governance issues across countries. The report summarizes the outcome of the Sustainability Index Istanbul Workshop, which was held on January 23, 2014 in Istanbul with the objective of facilitating a discussion between key stakeholders to ensure that the forthcoming Borsa Istanbul Sustainability Index will be beneficial to investors, issuers and the society. The report builds on the “background note” published prior to the workshop in January 2014 to help the workshop participants to prepare. The note provides a background review, against which Borsa Istanbul’s Sustainability Index Project unfolds, together with summary information on Turkey’s stock markets, the regulatory framework on sustainability indices constructed in other emerging markets, and the key sustainability issues in Turkey that are material for investors and other stakeholders. The relevant parts of the background note are included in this report to serve as a reference for interested readers. The purpose of the report is both to communicate the outcome of the workshop discussions and to offer our commentary regarding the issues highlighted during the workshop and our recommendations for moving forward. 'Sustainability Index Workshop', with the collaboration of Sabancı University Corporate Governance Forum (SU CGFT) and United Nations Sustainable Stock Exchanges Initiative (SSE) and the welfare fund of British Embassy, was carried out at Sabancı Center on the 23th of January, 2014. Sabancı University (SU) is actively supporting the project by providing intellectual support and by helping the rating process undertaken rating firm EIRIS. To help the process benefit from investors' and investment managers' input, SSE Initiative and SU are jointly organized the workshop in Istanbul and bring together the CEOs of top local asset management firms and investor relations managers of selected firms listed in BIST together with international institutional investors and BIST team. The opening speech of the workshop was held by Borsa Istanbul Executive Vice President Mustafa Kemal Yılmaz. Then the director of the SU-CGFT, Melsa Ararat made her speech. The main speech of the workshop was carried by the Amra Balic general manager of the BlackRock, which is the biggest asset management company in the world. After speeches, participants of the workshop made three different roundtables. They discussed about the determined questions and the moderators of each table made presentations about the results from tables. At the end of the workshop Melsa Ararat made synthesis and the closing speech. The Stock Exchange Istanbul (BIST), the Capital Markets Board (SPK), international and local portfolio managers, index rating agency EIRIS, investor relations officers that are in the BIST 30 index within and sustainability in the description leadership of the companies, UN Sustainable Stock Exchanges Initiative (SSE), the International Finance Corporation (IFC), the British Embassy, Turkey Corporate Governance Association (TKYD), Turkey Capital Market Intermediary Institutions Association (TSAKB), Turkey Investor Relations Association (TÜYİD), Turkish Industrialists' and Businessmen's Association (TUSIAD), Sustainable Development Association (SKD), the Central Registration Depository Institution (MKK) and the UN Global Compact network representatives of Turkey took place as workshop participant. The results from the workshop will be published in a report by Sabancı University Corporate Governance Forum. Please find the interview of SU-CGFT coordinator Melsa Ararat about Sustainability Index here. Please, also watch the live broadcast that UN SSE coordinator Anthony Miller and Borsa Istanbul Executive Vice President Mustafa Kemal Yılmaz has talked about Borsa İstanbul Sustainability Index. Melsa Ararat, the director of Sabanci University Corporate Governance Forum and SOM faculty member, will join a panel to discuss board diversity policy alternatives in a conference organized by De Nederlandsche Bank on 19-20 December in Amsterdam. The panel will include Joanne Kellemann , executive board member of De Nederlandsche Bank, Prof. Rene Adams and Hetahre Foust-Cummings, the research head of Catalyst. The conference will focus on dimensions of board diversity of banks. Please see the agenda here. The platform also includes the World of Business and Sustainable Development Society (SKD), the Banks Association of Turkey (TBB), Working Group on the Role of the Financial Sector on Sustainable Growth, Corporate Governance Society of Turkey (TKYD), Capital Market Brokers’ Association of Turkey (TSPAKB), TÜSİAD, Investor Relations Society (TÜYİD) and UN Global Compact Turkey Network. Turkey’s “Sustainability Platform” was established among nongovernmental organizations working on sustainability and supporting sustainable development, initiatives related to the subject, and other stakeholders. Established by an initiative of the Istanbul Stock Exchange, the platform aims to create synergy among sustainability efforts of different stakeholders. The Platform also seeks to improve media awareness of sustainability, create a better understanding of sustainability risks, and to create a common perspective towards the subject. ‘Corporate Social Responsibility For All Project’, funded by the European Union and led by Turkish Confederation of Employer Associations (TISK), aims to improve the capacity of enterprises in the field of Corporate Social Responsibility in South-Eastern Europe region employers’ organizations, where Turkey is located in. The opening meeting of the project was held in Ankara on April 18, 2013. In the opening meeting of the Project, which was started on 30 November 2012, and will last two years, the director of CGFT, Melsa Ararat made a presentation about ‘the present and future of CSR’. You can find further information about the Project here. The Electronic Assembly System (E-GKS), which provides an electronic platform for electronic voting to the shareholders of listed companies in stock Exchange, has received ‘Best Use of Online Services’ award in the scope of FSTech Awards. Financial Sector Technologies (FSTech), which is one of the industry’s leading magazine and broadcasts mainly for employees of information technology, rewards successful projects each year by following the innovations and developments in the sector. Providing data to CGFT, as well as advertising the system, and supporting the implementation of the E-GKS since the beginning, has not just only brought technological innovations, but also increased the transparency in stock Exchange and made a major contribution to eliminate the barriers in corporate governance. With this system, it is expected for Turkey to become much more attractive to global investors and to contribute to the Istanbul International Financial Center Project. The ‘Independent Women Directors’ Project, which aims to help publicly listed companies to give priority to women in nominating independent board members and help strengthen the position of women in decision making mechanisms, will be announced to the public and press with a launch event on 13 December 2012 at Conrad Hotel, Istanbul. Candace Johnson, Coordinator of the ‘Global Board Ready Women’ Project will deliver a key note speech at the event. Following the message of Daniela Bankier, Head of Unit for Equality between Women and Men at the European Commission and the speech of Torkel Stiernlöf, Consul General of Sweden in Istanbul, Caroline Sundewall, an independent director of a number of Swedish firms, will be sharing the experience of Sweden that has achieved a relatively high percentage of women in boards without a quota. Dr. Melsa Ararat will follow with the results of ‘Women Directors in Turkey’s Publicly-Listed Companies 2012’ report with the participants. Closing remarks by Murat Yeşildere, the Head of Egon Zehnder International’s Istanbul Office and the event will end with a cocktail. Please find more information here. CDP Turkey 2012 Climate Change Report was announced at the Seed at Sakıp Sabancı Museum with the launching meeting. At the launcing meeting, the result of CDP Turkey 2012 Report, with 60% rate of increase in last year have the response of 32 companies, was announced. Please find the CDP Turkey 2012 Climate Change Report here. Two working papers by CGFT fellow are issued. Please find the working papers here. CDP Turkey, carried out by Sabancı University and sponsored by Akbank, announced its 2011 results to the public with the participation of Fatih Birol, Chief Economist in International Energy Agency. CDP Turkey has been conducted by Sabancı University Corporate Governance Forum of Turkey since 2010. As a part of the world’s most common and prestigious environmental initiative, CDP Turkey announced its second year results. Companies listed on ISE National-100 Index were invited to share their greenhouse gas emissions and risk management strategies about climate change with investors. As a result of this study, CDP 2011 Turkey-100 Report was published by Sabancı University with the contribution of Ernst & Young, indicating the climate change trends in Turkey and the analysis of the company reports. The participants in the panel “Climate Change and Emerging Markets” were Sue Howells, Head of Global Operations of CDP; Alexis Krajeski, Associate Director of Governance & Sustainable Investment at F&C Investments; Giorgio Capurri, Corporate Sustainability and CSR Manager of UniCredit; and Melsa Ararat, Sabancı University Faculty Member and CDP Turkey Director. The panelists emphasized that the damages climate change causes on earth has reached the point of no return and that the importance of companies which can provide financial resources in the climate change context is increasing. The meeting ended with the Carbon Disclosure Leaders Award Ceremony that was given for the first time in this meeting. The companies which disclosed their greenhouse gas emissions and risk management strategies about climate change in the most transparent way to the public through CDP were chosen for the awards. According to Ernst & Young’s methodology with the usage of CDP data, Türk Telekom and Zorlu Energy Group were awarded as Carbon Disclosure Leaders 2011 by holding the highest scores. Türk Telekom received its award from Professor Nihat Berker, Rector of Sabancı University, and Zorlu Energy Group received its award from Mustafa Çamlıca, Ernst & Young Turkey Country Leader.